Figure A41. 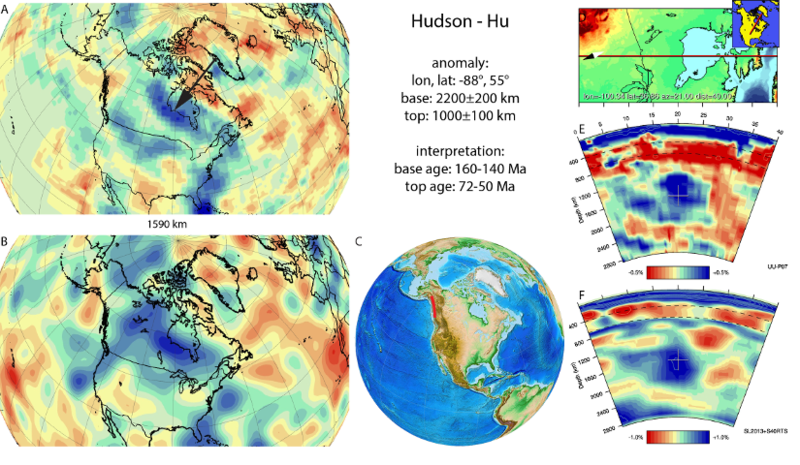 Hudson anomaly, interpreted as the Hudson slab, with (horizontal) [vertical] cross sections through (A)[D] the UUP07 p-wave) and (B)[D] the combined SL2013 and S40RTS s-wave models at 1590 km; C) the location of the modern geological record that we interpret to have formed during the subduction of the slab. The Hudson anomaly (Figure A41) is part of the set of anomalies commonly, also in our previous compilation in van der Meer et al. (2010), referred to as the Farallon slab, initially defined by Grand et al. (1997). It is located below northern North America within the lower mantle. The NW-SE trending Hudson anomaly is interpreted as the northernmost slab of the family of Farallon slabs and is entirely contained in the lower mantle. At its eastern end it connects to the northern part of the N-S trending Hatteras slab. Sigloch and Mihalynuk (2013) referred to the Hudson slab as the ANG slab, and inferred that it formed due to southwestward subduction of Angayucham oceanic lithosphere since 140 Myr based on their interpretation of the amalgamation history of the Wrangellia superterrane of the North American Cordillera. We infer Angayucham subduction led to the formation of the Lougheed slab instead. Rather, we follow Nokleberg et al. (2000), who suggested that eastward subduction of Farallon/Panthalassa lithosphere occurred at this latitudinal position at the Stikinia arc while it was (close to) being accreted to the continental margin subduction zone (Hatteras slab). Collision started by 72-69 Myr and was accomplished by 55-50 Myr ago (Sigloch and Mihalynuk; 2013), which we take as age range for the top of the slab. Johnston and Borel (2007) interpreted a two-stage process, a first involving intra-oceanic subduction and arc formation and accretion forming the Stikinia-Quesnellia superterrane between 230 Ma to 150 Ma within the (eastern) Panthalassa. In a second stage, from 150 Ma to 55 Ma, this arc migrated towards North America, collided, and moved northward parallel to the continental margin. We interpret stage one to have resulted in the Wichita slab and correlate their stage two with the Hudson slab.